Staying under the radar and maintaining a low profile is essential to effective tactical work. Blackhawk! has designed the Stealth Weapons Catch to meet these needs in the field. The special holder employs a spring steel frame with a tough and durable fabric overlay that is guaranteed to hold up through the wear and tear of daily use. The weapon catch features an adjustable elastic retention strap that removes silently, eliminating the sound of loud snaps or ripping of Velcro that can give away one's position. The Stealth can be used ambidextrously and securely holds rifles, shotguns or other weapons and tools. Blackhawk! 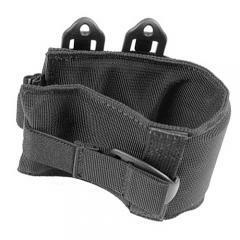 includes two of their signature Speed Clips for convenient interfacing with MOLLE gear, as well as two A.L.I.C.E. clips for belt mounting options. The retention device for molle is poor, works good if you are just going to look at it.